On August 8, 2017, the New York State Bar Association Committee on Professional Ethics joined New Jersey, Ohio, South Carolina, and Pennsylvania and said “no” to Avvo Advisor, a pay-for-service lawyer referral plan that is available in Louisiana. See N.Y. State Bar Assoc. Cmte. on Prof’l Ethics, Op. No. 1132 (Aug. 8, 2017). How does the Avvo service work? 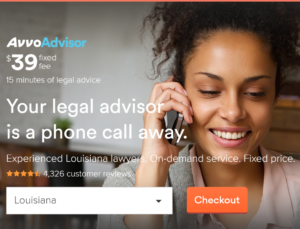 A prospective client visits the website https://www.avvo.com/advisor, selects the legal services needed, pays Avvo a fixed fee, and Avvo arranges for an “experienced Louisiana lawyer” to return the prospective client’s call within minutes. After the lawyer provides the services, Avvo sends the lawyer “100% of the client’s payment.” The lawyer then “[a]s a completely separate transaction,” pays a “per-service marketing fee.” The amount of that marketing fee “depends on the service, and ranges from a $10 marketing fee for a $39 service, to $40 marketing fee for a $149 service, up to a $400 marketing fee for a $2995 service. See Attorney FAQ for Avvo Legal Services. “Is it ethical?,” you ask. According to Avvo, “yes, it is.” Avvo says that it is not getting paid for lawyer referrals: “Avvo is not referring people to a particular lawyer. Potential client choose which attorney they would like to work with from all available, participating attorneys.” Furthermore, Avvo says that it is not sharing in legal fees: “Fee splits are not inherently unethical. They only become a problem if the split creates a situation that may compromise a lawyer’s professional independence of judgment. We believe that Avvo Legal Services fees, if deducted like credit card fees, would involve the sort of technical fee split that would not create such a potential for compromise.” See id. The problem is that Avvo is wrong for at least two reasons. Our conclusion is bolstered by Avvo’s satisfaction guarantee, by which the full amount of the client’s payment (including Avvo’s portion of the fee) is refunded if the client is not satisfied. This guarantee contributes to the impression that Avvo is “recommending” the lawyers on its service because it stands behind them to the extent of refunding payment if the client is not satisfied. the Avvo website offers an impermissible referral service, in violation of Rules of Professional Conduct 7.2(c) and 7.3(d), as well as improper fee sharing with a nonlawyer in violation of Rule of Professional Conduct 5.4(a). See Notice to the Bar, Lawyer Participation in the Avvo Legal Service Program (Jun. 21, 2017). Ohio and South Carolina have reached similar conclusions. On July 14, 2016, the South Carolina Bar advised lawyers not to participate in the service because the “marketing fee” payment is impermissible fee sharing under Rule 5.4(a). See South Carolina Bar Assoc., Ethics Advisory Op. 16-06 (Jul. 14, 2016). The Ohio Supreme Court Board of Professional Conduct and legal-ethics commentators reached similar negative conclusions. See Sup. Ct. of Oh. Bd. of Prof’l Conduct, Op. No. 2016-3 (Jun. 3, 2016); Alberto Bernabe, South Carolina Ethics Advisory Opinion Finds That Participating in Programs Like Avvo Legal Services is Unethical, Professional Responsibility Blog (Aug. 12, 2016); Scott H. Greenfield, The Trouble with Avvo’s Ethics, Simple Justice (Aug. 12, 2016). Considering these unfavorable ethics opinions, Louisiana lawyers should avoid participating in Avvo Advisor. Louisiana Rule 5.4(a) provides that a “lawyer or law firm shall not share legal fees with a nonlawyer,” except under unusual circumstances. Similarly, Louisiana Rule 7.2(c)(13) provides that a “lawyer shall not give anything of value to a person for recommending the lawyer’s services, except that a lawyer may pay the reasonable cost of advertising or written or recorded communication permitted by these Rules, and may pay the usual charges of a lawyer referral service . . . .” Both rules are squarely implicated by Avvo’s questionable business model.